One day last fall, I taught several library lessons to seniors in AP Literature classes. They were preparing to start a seven-month research project on an author of their choice. The assignment involved reading three novels by the author and using literary criticism to analyze rhetorical devices. Each month they had a research-based paper to write, culminating in the final research project. The twelfth-grade students sat around tables as I presented an interactive Google Slides show, in which I showed them how to access educational search engines, Google Books/Scholar, and various databases. We discussed the reasons that Google searching was not the best method to use for this type of research, and went over the definitions of peer-reviewed and credible articles. I demonstrated the process of an actual keyword search, including the use of limiters and citation tools. The students were actively engaged in the lesson and indicated that they understood the material. When I released them to the computers to begin their information gathering, I had high expectations. As I walked around the room, I was surprised to see that a large number of them had immediately started with a Google search. When I gently guided them back toward the databases or, if they were gathering initial background information, to a credible search engine like Sweet Search, they shrugged and asked me to remind them how to get to these sites. The idea of research is overwhelming, even to high-achieving high school students. One of the main reasons is that students often are not given a strong foundation in the process of research. I think back to my high school days and remember photocopying articles on microfilm, checking out a few books, and using these resources to write my paper. Today’s students are bombarded with information and materials, most of it online and accessed with the click of a computer key. The upside of this is the amount of information we have at our fingertips. The downside is that teenagers don’t know how to navigate such a deep sea of knowledge. My experience last year made me realize how important it is for schools to implement a comprehensive research agenda beginning in middle school, and reinforced continually throughout high school. All too often students are first being confronted with research in eleventh and twelfth grade. Because of this, it’s critical to repeatedly teach them the basics in a way that will prepare them well for the more serious research they may encounter in college and beyond. As school librarians, we have a unique role as those who administer lessons on the intricacies of information search strategies and research processes. It is crucial to pursue frequent collaborations with all subject teachers in order to maintain the flow of instruction related to research. As I prepare to teach this year’s AP students in the upcoming week, I will try once again to instill in them the habits of successful researchers. Teens are notorious for having little patience; they often wait until the last minute and want to get things done quickly. Teach students that learning as much as they can about a topic before starting their formal research gives them a solid understanding and familiarity with their subject. In addition to directing students to credible articles, encourage them to use multimedia sources such as podcasts, videos, and audiobooks to gain background information. Discourage them from taking notes during this process. Students have a hard time organizing their thoughts, let alone their research findings. Modern technological tools can make a huge difference in easing the process. 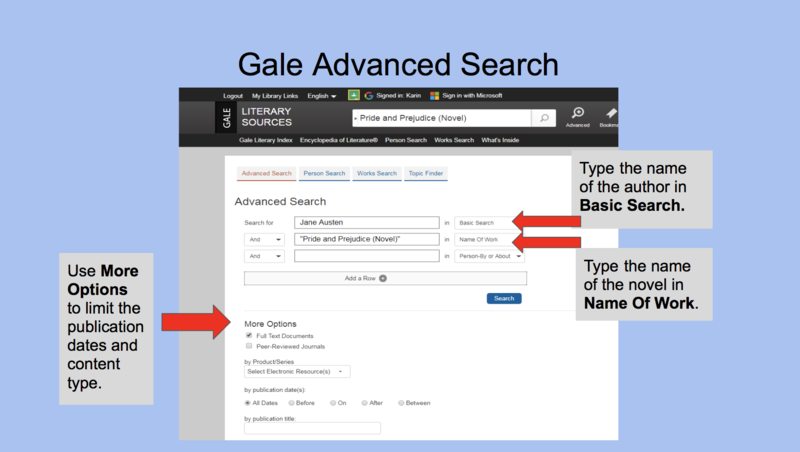 On many databases, such as Gale, students can link to their Google accounts and share articles to their Google Drive. This saves paper and also prevents students from losing any research. Citation tools, built into all databases, allow students to easily copy the citation information, copy it, and paste it directly into a Works Cited page on a Google Doc or other platform. I think this is a universal! I’ve embraced it and immediately send them to Wikipedia for their topic. I explain that in order to use databases effectively, they must know the key terms associated with the topic – Wikipedia provides them that. I make it absolutely clear that reading a Wikipedia article is not research and that they should not use it for citations within their project. Sending them to Wikipedia, to get background knowledge and to find key terms, allows students to enter the conversation (and the project) feeling more confident about their understanding of what is going on and possibly which direction they are going.